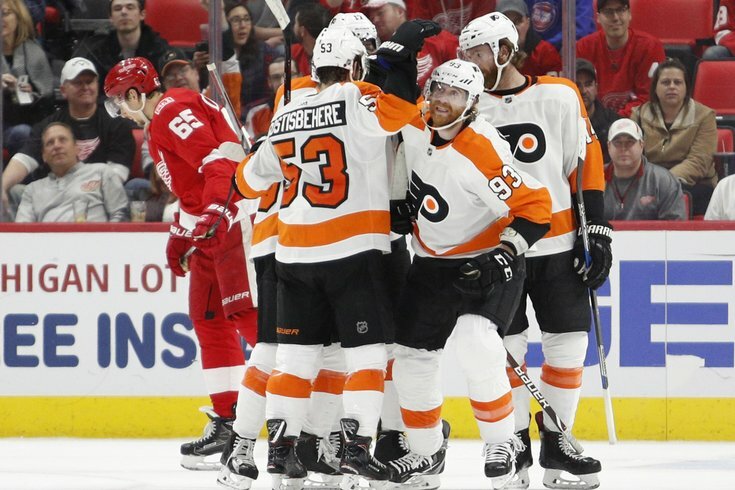 Philadelphia Flyers right wing Jakub Voracek celebrates with teammates after scoring a goal during the second period against the Detroit Red Wings. A little over a month ago there seemed to be no hope. The Flyers were among the NHL’s worst teams. They had lost 10-straight games. They had been outscored 6-1 in the last two games of that horrid stretch. Nothing seemed to be working, other than the solid goaltending of Brian Elliott and the work being done by the first line of Jake Voracek, Sean Couturier and Claude Giroux. The Flyers put up a collective front that things were working — though on the surface nothing seemed to be working. Maybe Flyers’ coach Dave Hakstol and his team were right. Since Dec. 2, the Flyers are 16-6-1 in their last 23 games. They’ve moved from eighth to tied for third in the NHL’s Eastern Conference Metropolitan Division, erasing the 11-point deficit the New Jersey Devils once had on them. They are 8-2 over their last 10 games and 8-3 in January. They are 5-2-4 within their own division. Good starts appear to be the key. Two trends stand out: The Flyers are 7-0-2 after leading after one period and 18-0-3 after leading games after two periods. Of the 33 games remaining on their schedule, only six games ae against Western Division teams, which the Flyers are 10-10-4 against. Two of the six games, however, come against the biggest secret in sports, the expansion Vegas Golden Knights, who lead the Western Conference with 68 points. Entering the All-Star break, the Flyers hold the last playoff spot in the Eastern Conference, when not that long ago any mention of making the playoffs was considered a joke. How have the Flyers climbed from the brink of a wasted situation? They’ve done it by Hakstol mixing up the lines and continued production from Couturier, who is tied for fifth in the NHL with 26 goals, Giroux, who has been nothing short of stellar, tied for fifth in the NHL with 57 points (14 goals and 43 assists) and the play of Elliott, who is 14 th in the NHL with 1,004 saves. It’s also helped that younger players, like rookie defensemen Robert Hagg, are maturing. Entering Thursday’s 5-1 loss to Tampa Bay, the NHL’s top team, Hagg led the NHL with 167 hits, after recording 25 in the previous five games. He led all rookies in blocked shots with 66, and his TOI average of 18:47 was second among rookies. Hagg was also plus-14 (dropped to a plus-13 after the Tampa loss), which at the time was tied for third-best among all rookies. The most recent Flyers rookie to finish a season at plus-14 or better was Couturier, who was plus-18 in 2011-12. Another key, lately, has been the play of Travis Konecny, who’s obviously benefitted from being on the top line with Couturier and Giroux. Konecny scored the Flyers’ lone goal against Tampa Bay to extend his scoring streak to five games. Entering the break, he has four goals and two assists during the run, and also carries a four-game goal-scoring streak. In his last 13 games, Konecny has six goals and six assists for 12 points. The setback against Tampa Bay didn’t seem to carry the sting losses did back in December.